This is a script that allows magic and skills to be reflected by element, rather than 'magic' or not. Reflects everything by elements (like Fire or Ice) rather than INT-F > 0. Can also reflect by INT-F > 0, and also ATK-F > 0! Rather difficult to take screen shots, but here are 2 anyways. A good place to put this is probably above MAIN and below the default scripts. If your using a CBS, if it is to work at all, it'd likely have to be below that. a.) 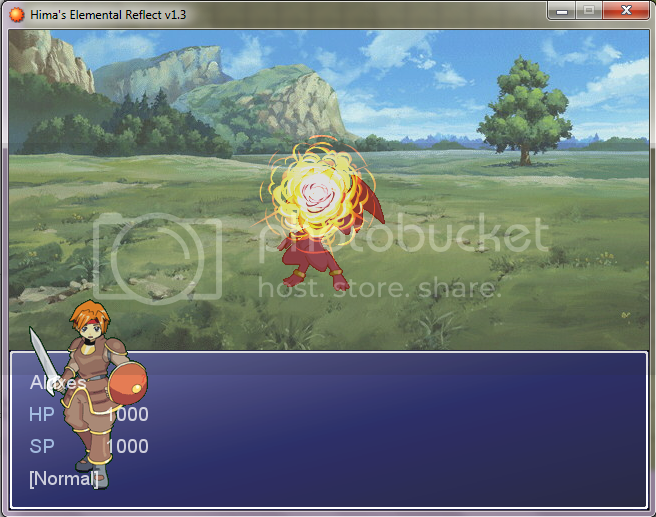 You can now choose to reflect any physical or magical skill. b.) Physical reflect will also reflect any basic attack. 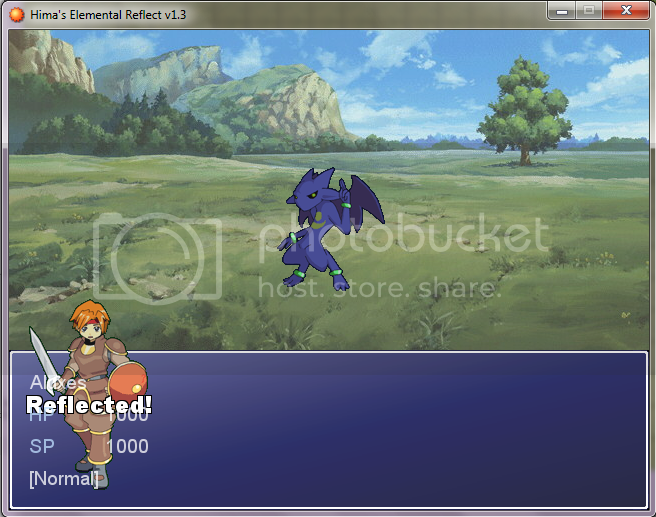 c.) Basic attack with element will also be reflected from elemental reflector. 1.3 - Fixed some bugs that occur when you don't put all the ELEMENTS you defined into the database. lady who made this script. "ELEM_REFLECT_ID" = The ID of the element you want to check or raise to 'A'. though you should probably relate it to the proper element. It must be within the quotes, though. ID_TO_REFLECT = This is the ID of the element that will be reflected. skills with an ATK-Force > 0 and even normal attacks. of skills with an INT-Force > 0, regardless of element. WORD - This is the string that will pop up when a skill is reflected. enemy reflects the ice element, it will just say "Block". I hid instructions at the top of the script. Feel free to download to the demo for demonstration and such. I don't believe it works with Cogwheel's RTAB. I haven't tested it with anything else, but it probably doesn't work well with things outside of the DBS. Hima made this! I did not! S/He asked for a name as credit. That is all. No special words of advice. Just use and enjoy. is anyone putting this to wonderful use? Or is this rendered useless thanks to Blizzard's own Reflection system? I know this topic is pretty old, but since it's in the script database, it should be addressed for those who come here from it. I set up the script and everything database item right and when I used it in the DBS, nothing seems to happen (yes, it is above "Main"). Has anyone gotten this to work before? I'm in the process of re-writing this script (and a bundle of others) to be re-released. To answer the question though, I myself have functioned it. Perhaps linking a copy of a naked project with this script in it how you think it needs to be setup, yet not working, would help me troubleshoot any issues you have. :\ Looking at project, you failed to setup the database at all. This project is an example of how it should be setup. Also, you could've downloaded the demo for explanation too, if it wasn't working.